Sonora, CA...The Sonora Bach Festival will present classical guitarist Gordon Rowland and the cooking of Chef David Ingram at the final event of their 40th year celebration on Sunday, October 30 at 12:30 at Mt. Calvary Lutheran Church Fellowship Hall at 24176 Pine Lake Drive Sugar Pine, CA. Reservations, which include the performance and Brunch, at $35 are available on the festival’s webpage sonorabach.org or by calling 209 536-6300. For more information go to the festival’s webpage at facebook.com/SonoraBachFestival. Seating is limited so reservations are encouraged. The Sonora Bach Festival will hold their final event of their 40th anniversary year Sunday, October 30 when they present classical guitarist Gordon Rowland at a brunch catered by Chef David Ingram. The event will be held in the Fellowship Hall of Mt. Calvary Lutheran Church in Sugar Pine a short and easy 20-minute drive from Sonora through the pines. The program will include music from the Renaissance and the Baroque periods as well as three compositions by Mr. Rowland. The bountiful brunch will include salads, multiple entrees, side dishes and dessert. For October 21, 2014 ,9:00 A.M.
Gordon Rowland, Sutter Creek resident, brings to the Bach Festival a wide background in guitar. He has concertized extensively throughout the country but particularly in Northern California where he has performed for the Sacramento Guitar Society and many venues in the San Francisco Bay area. 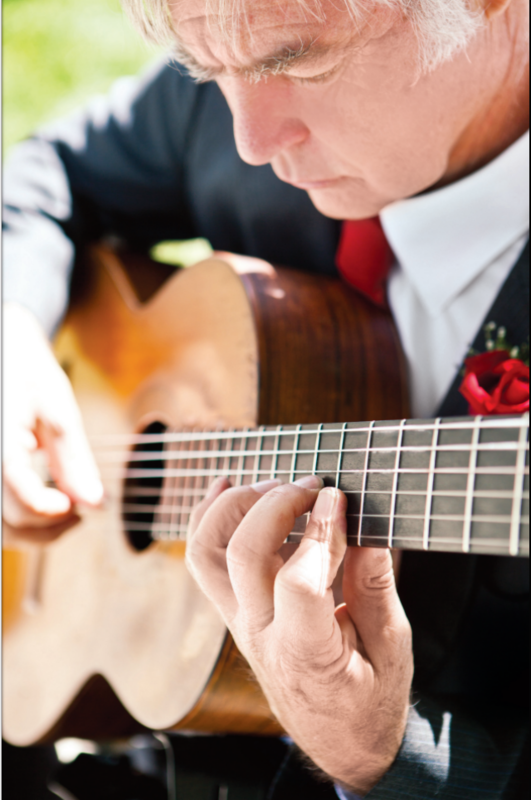 Gordon is trained in a variety of styles including classical, flamenco, and jazz. Classically, he has participated in master classes with world-class guitarists including Segovia protégés Michael Lorimer and Italian Oscar Ghiglia as well as Christopher Parkening. He holds a degree from Idaho State with further study at Boise State. As a teacher, he has held numerous master classes, instructed at the College of Idaho in Caldwell and Treasure Valley Community College in Oregon, and presently teaches privately. Mr. Rowland has released 5 CD’s and published texts of music and guitar theory. He is listed in Who’s Who in Music International. The musical program will consist of three centuries of lute music transcribed for guitar. Among the pieces will be compositions by Louis Milan and John Dowland. J.S. Bach will be represented with the Prelude in A minor and the Prelude, Gavotte and Rondeau from the Violin Suite, #4 transcribed for guitar. Bach frequently rewrote his music for other instruments. This performance will be an example of Bach having taken his suite for solo violin and then rewriting it so it could be played on lute- one of the most poular instruments of his time. Someone other than Bach later adapted the lute transcription for guitar when that instrument surpassed the lute in popularity. The caterer for the brunch, Dave Ingram grew up cooking under the tutelage of his mother. “I loved it and I’ve stuck with it,” says Dave. Aside from early training he has also had experience Bay Area restaurants including the highly regarded Insalata’s in San Anselmo. Locally he has worked at the Black Oak Casino as Pastry Chef. He owns his own catering business Chef Dave Cooks through which he has prepared food for a number of local civic organizations, businesses and individuals in the area. One unique feature of the catering is that Chef Dave can provide food for individual meals at one’s home. “This event is going to be very special,” says festival director, Sandra Betti. “The music, the food and the atmosphere in the woods make for a delightful way to spend a Sunday afternoon. We hope our residents don’t miss it”. Event occurs on 10/30/2016 from 12:30 PM to .